In the five short years since its inception, the LVMH prize has established itself as one of the most prestigious, progressive and pioneering accolades within the ever-expanding fashion industry. With a unique knack for recognising the most promising talent and harnessing some of fashions brightest and boldest conceptual thinkers, the prize is a life-changing achievement for the young designers of today. 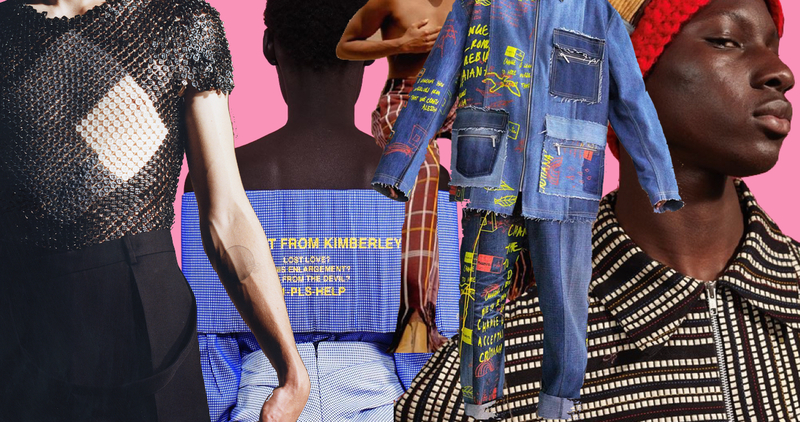 It’s given us Marine Serre and Jacquemus, Grace Wales Bonner and Marques Almeida—designers spearheading the fashion world as we know it. And this year promises nothing less. Whittled down from 20 to the final eight by 63 of fashion’s international elite—including Naomi Campbell and Edward Enniful—following the presentation of their collections in Paris earlier this month, the finalists emerge from all corners of the globe making this year’s prize the most diverse since its birth six years ago. The prize will be juried by a mighty fleet including Marc Jacobs, Kris Van Assche, Nicolas Ghesquière, Jonathan Anderson and Maria Grazia Chiuri with the winner being announced this June at Fondation Louis Vuitton in Paris. And even those who “miss the mark” (so to speak) are surely destined for greatness, joining an alumnus of heavyweights like GmbH, Martine Rose, Y/Project and A COLD WALL*, all of whom also boast the acclaim of LVMH runner-ups. Here we boil each of the eight finalists down to their essentials—the who/what/where of fashion’s next big things. WHAT: Technologically and scientifically inspired cerebral designs exuding a crossover between craftsmanship and industrial machinery, culminating in otherworldly womenswear. WHAT: Conscious activism and sustainable gender-neutral garments that have already earned the Queen Elizabeth II Award. Hasheem, Look Thirty-Five Indo-Canadian, SS19 Photography by Andrew Jacobs Styling by Michael Darlington Grooming by Tomomi Sano Couch by Green River Project LLC Look available this Spring, email [email protected] for information. WHAT: Contemporary menswear stemming from an archival approach to antique materials and old craft, drawn with inspiration from bygone objects and emotional histories. WHAT: Pragmatic gender-neutral fashion with a keen focus on comfort, class and concept alongside an elegant sartorial vision that is as beautiful inside as it is outside. WHAT: Childish Gambino-approved fluid fashion that takes traditional Nigerian weaving techniques and patterns and transports them into a contemporary fashion context. WHAT: West Coast edge fused with sustainability, resulting in shifting, unisex and culture curious fashion. WHAT: Award-winning concept-wary menswear (fresh outta CSM) which transforms banality into striking silhouettes. WHAT: Womenswear focused on pillars of quality and culture, drawing influences from South Africa’s multi-faceted history and female identity.